It is November. A trip to Arunachal Pradesh in north-eastern India is scheduled. Due to delays in domestic flights I find out, that there are still three days left . Now you can spend the time in New Delhi, the capital of India, of course. According to some strange statistics the human population of New Delhi barely exceeds 250,000 people, but there are still at least several million in the Delhi area. Nature must stand back there. 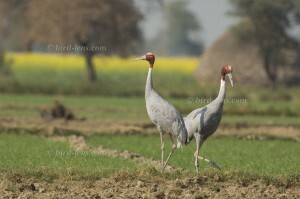 Nevertheless, there are practically some interesting areas within the city limits, such as Sultanpur, and in the vicinity is also Keoladeo, a national park in the Indian state of Rajasthan, which has been object of a blog on www.bird-lens.com already.. It is also known as Bharatpur Bird Sanctuary. The national park is not too far south of the city of New Delhi. Since I had already read about this bird paradise, I opted for the Keoladeo Ghana Bird Sanctuary. From Germany, the first part of the trip went to Amman, then after a stopover to New Delhi. Actually I had arranged with the hotel directly located at the park entrance – the Birder’s Inn – that I get a lift from the airport at additional costs. The Birder’s Inn is quite recommended on the Internet for a stay in the area. When I accomplished the passport control, baggage claim and the retriev of money in Indian currency at an ATM, I must go and look for a taxi to Bharatpur. The pick-up service is in fact not there. A taxi agent speaks to me. I start in a bargain and get him down to 3,500 IR – this is roughly 42,- Euro – for the one-way driving southward. Then I think to use the morning hours for some more birding nearer to the airport. That is still on the way and a good location might be Sultanpur. Ok, that for additional costs. So in total now again 5000 IR . A little later a reliable looking English speaking taxi driver comes in a fairly new Tata. While waiting, I notice the little Mynas. These are not known to me as the Common Myna, Acridotheres tristis, from other parts of the world. But hey, they ‘re much more intensively colored. There are Bank Myna ( Acridotheres ginginianus ). This is my first “new” bird. Now driving starts into the beautiful morning light. Again and again, the driver attempts to dry the fogged windows. I did not think how much time passes with this procedure. First he buys a newspaper to dry the front window from inside. Eventually we come to Gurgaon. I’m not sure if he is litteral and therefore understand the directions that I had copied for me. All the time we get stuck in traffic. But the weather is so nice. Fresh and slightly hazy. When we finally arrive in Gurgaon, he stops and asks the locals for directions. Then he opened up to me that we still had 45 km to go. He starts to bargain the price again. Unfortunately “…. totally different direction. ” When he still wants 2000 IR more, I let him turn around. Maybe it is too late in the day already and the bird already quiet. To run in the middle of the afternoon heat through the area is not a pleasure. After all, I want to enjoy the stay there and do not want think all the time, that I still have to go through crowded streets a further 200km down to Bharatpur. Watching out of the window reveals the first birds. Many House Crow (Corvus splendens), some domestic – or Rock – Pigeons (Columba livia) and some more Mynas. Ok, so now directly to Bharatpur for Keoladeo National Park. My driver takes a shortcut that runs near a garbage dump. The dump is located in a beautiful hilly area of ​​acacia. Here we are already at the famous – but now increasingly populated – Delhi Rim. At one of the access roads, I cannot withstand and let him park. Immediately, I see a couple of chickens that remind me very much of our native Partridges. But these are probably the most widespread Grey Francolin (Francolinus pondicerianus). Black Kites (Milvus migrans) are soaring overhead. In between, House Crow and some Pigeons. A small dove take flight when I approach it. It’s a Laughing Dove (Streptopelia senegalensis). Then I see another bird, a White-eared Bulbul, ( Pycnonotus leucotis ) and a Drongo. From the latter I can still take pictures quickly as I walk back to the car to take my camera. As the photos show, it is here to Black Drongo (Dicrurus macrocercus). In the sky a few Cattle Egret (Bubulcus ibis) pass by and I make another bird, a Lapwing to take flight. The latter is probably the Yellow-wattled Lapwing (Vanellus malabaricus) , the only lapwing, which is quite common in such a dry habitat. Again and again you hear “chak , chak”. This is probably Lesser Whitethroat (Sylvia curruca) I think. So it is. But this knowledge is hidden from me until I stay in Bharatpur, where this is the most common background sound. Once I think I can see a Black Redstart ( Phoenicurus ochruros ) luring out of a dense shrub. It starts to become really warm. Ok, now back to the car. Almost back at the car I am getting aware of a Warbler by its hard calls. It looks quite big. As the photos show later, it is a Greenish Warbler (Phylloscopus trochiloides) of the nominate race – this means without the wingbars of its relative. Characteristic is a quite large and well-developed supraorbital stripe that extends much further than in a Chiffchaff to the neck. Also briefly I see that the beak is yellow and not black. Than another bird, which is beautiful sitting on a pile of shredded paper. It is a Yellow Wagtail (Motacilla flava) , which stands there with a very ruffled non-breeding plumage. The car takes its way on a reasonably trafficked road that leads all the time through a beautiful landscape of acacia on a chalk rock underground. A real dream and obviously not so densely populated. But then we come to Faridabad. Here you can see how densely populated the area is. The city is jam-packed , with rickshaw, tricycles, bicycles, motorbikes, buses, trucks, construction vehicles cow or horse-drawn vehicles and masses of pedestrians. Madness! It takes an incredibly long time to pass through densely populated and busy cities to the south. But I must admit: The roads are very well developed from time to time outside the villages. So well in shape that they even take toll. In between, I let the driver stop the taxi, simply because I cannot stand the thirst any longer. So I buy 2 sealed water bottles at a gas station. The driver has to stop anyway for gas. But no diesel (like 3 more gas stations further on). Here I will asked for Thai (ie tea) drinking. I do not trust myself and refrain – hopefully polite enough. Driving continues endlessly through a largely flat – but not unattractive – landscape. The monotonous landscape is constantly enriched by the many archaic chimneys that can be seen on the horizon as well as directly on the roadside. These are – if I am right – all brick “factories” that are still operated in old traditions. You also see everywhere how the brick is processed – also along the roadside. Finally we leave the main road to Agra. Now we are really in rural countryside. But that does not mean that the traffic diminishes. Quite the contrary. But now you can see Stilts (Himantopus himantopus) on every second pond. White-throated Kingfisher (Halcyon smyrnensis) are sitting abundant on the power lines. Interesting is that my driver has to rush out of the car at each provincial border to prove its licences; supposingly he must also pay customs. Eventually we see very close to the road 2 Sarus Cranes (Grus antigone). Wow, that’s great. But with the heavy traffic behind us, I do not want to cause no traffic jam and therefore waive to stop. Anyway, the Black-winged Kites (Elanus caeruleus) sitting on the power poles all the time, is excellent birding, too. Finally, at around 2:00 p.m. we arrive to Bharatpur. A long journey comes to an end. As it turns out , the town is not so small.